We’d love your help. 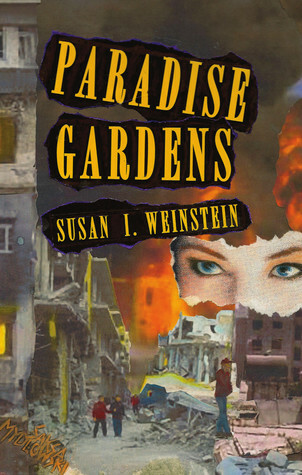 Let us know what’s wrong with this preview of Paradise Gardens New Edition by Susan I. Weinstein. The definitive new edition of Weinstein's PARADISE GARDENS is illustrated with significant new material. This Orwellian speculative fiction set in a near future world where the Federal government has dissolved amid ecological breakdown. In the 2250s, Nate Greenfield, real estate visionary, with the help of P.R. maven Madge Chilton, sells corporate business on his "eden und The definitive new edition of Weinstein's PARADISE GARDENS is illustrated with significant new material. This Orwellian speculative fiction set in a near future world where the Federal government has dissolved amid ecological breakdown. In the 2250s, Nate Greenfield, real estate visionary, with the help of P.R. maven Madge Chilton, sells corporate business on his "eden underground." PARADISE GARDENS becomes the home of the United Business Estates (U.B.E). Left behind are the Unconnected, people outside corporate protection. Capitalism has devolved into the corporate feudalism of the U.B.E., where employees are conceived as Superior or Average to fit the needs of business. Suspended between the settings of 2250s on the Earth's surface in NYC and 3011s underground, chapters alternate with a revolving cast of characters. Fates are determined by the Psychologicians, who manage the civilization's data base. Yet, when model employee Janet McCarthy finds herself caught in a web of alternate identities, only her lover Michael can attempt to cut her loose. At stake, is the reset of the planet. In this cautionary near-future, Upton Sinclair's classic It Can't Happen Here, has already happened. It is a vision at once strange and familiar. The recognition it brings is a dark pleasure. To ask other readers questions about Paradise Gardens New Edition, please sign up. I just finished reading "Paradise Gardens" and it was an interesting story. I liked the story line and the characters are strong. This is the second book I have read by this author and I liked it as well. There was a lot going on in this book, like the cover. The author did a great job of creating a world to escape to. I give this book a 4/5. I was given this book for the purpose of a review and all opinions are my own. This new edition is not a reprint but a definitive edition with an updated text, 11 illustrations by the author, a preface, reader's guide and other significant changes. So if thinking of buying do consider this vastly improved Nre Edition from the publisher at www.pelekinesis.com. A depressingly plausible vision of centuries to come, Paradise Gardens depicts a world where government has given up, ceding control to corporations. Services and commodities are available only to the wealthy, and the lives of the poor are nasty, brutish and short. It is a kind of idealised version of Trump’s America, and is one of the nastiest dystopian societies I have seen. Other reviewers have described the book as Orwellian, but I thought it had more resonance with Huxley’s Brave New World A depressingly plausible vision of centuries to come, Paradise Gardens depicts a world where government has given up, ceding control to corporations. Services and commodities are available only to the wealthy, and the lives of the poor are nasty, brutish and short. It is a kind of idealised version of Trump’s America, and is one of the nastiest dystopian societies I have seen. Other reviewers have described the book as Orwellian, but I thought it had more resonance with Huxley’s Brave New World than with 1984. The action hops disconcertingly between two time sequences separated by more than 750 years. I found this initially confusing, and in fact had to go back and start the book again with my notebook and pencil to hand. This is not a book to read with one eye while you watch the children with the other; it demands a certain level of concentration. The book is not without flaws, and I was disconcerted by the long (around 700 years) gap in the middle of the timeline, where nothing seems to happen at all, and by Ms Estemaya’s name changing from Elena in the early part of the book to Raquel in the final chapters. Estemaya was the most engaging character of the lot, and I’d have liked to see more of her, but sadly she makes but a few short appearances. In general, I’d have liked to see the few principal characters more developed; I think it would have made for a more entertaining read, but the book certainly does do a great job of filling one with fear for our future.